The thermometer on my car read negative five when I pulled out of the driveway, but by the time I’d reached the sunny parking lot at the Rock Lake Ski Trails, it was up to zero. A brisk wind hurried through the trees and imparted a sense of urgency to the day – partly because I was rushing to get skiing before the cold seeped in. Sunshine. Great snow. Rollercoaster hills. Weasel tracks quilting the drifts. I veered right at the first three intersections before finally turning left onto the 11.5 kilometer loop. Lost in thought, I alternated between thinking about my to-do list and thinking about technique. Then shapes in the messy snow along the ski tracks crackled through my subconscious and brought me zooming back to the present. Big feet…four naily, untrimmed toes…and lots of them. Suddenly I was skiing alongside the tracks of a wolf pack. 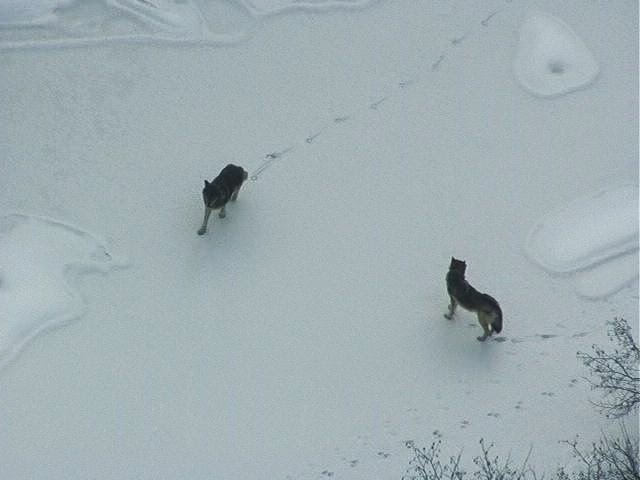 They were polite wolves, for the most part, and rarely stepped in the ski tracks. Confined to the narrow strips of smoothly groomed snow on either side of the trail, the mess of tracks on both sides of me indicated that there were at least five or six wolves traveling together. While on the hard-packed trail, they walked freestyle in their own paths. In a couple locations the tracks all left the ski trail in a single file line. Suddenly several wolves looked like one. To save energy, many animals will walk with direct registry. That means back feet land in the tracks of front feet, and members of a line will all step in the same places. Humans do this, too, especially in deep snow. It’s much easier to walk in someone else’s footprints instead of breaking through the crust with each step on your own unique path. In a few places one wolf did step into the smooth valley of the ski track. His paws were perfectly imprinted there, undisturbed by any other skier. I was the first human to glide over them. These tracks were made just last night. I was going their direction. There were wolves at the end of these tracks. And it’s true. The tracks grounded me back in the present: in the crisp, sunny woods; in my rosy cheeks; and the liquid cold that filled my lungs. When I stopped shushing along to look closer, the sound of the wind in the trees filled my ears. Creaking and moaning, snapping and popping, the trees seemed to be composing their own melodramatic poetry against the bluebird sky. The woods felt alive. When I lived out east, and out west, I missed that sense of thrill that comes from sharing space with the untamed grace of wolves. History says they won’t bother me. But biology says they could. I know that not everyone agrees, but feel incredibly fortunate to live in a place that is wild enough for them. It wasn’t always that way. We killed them off once. A small number hid out in the remote areas of northern Minnesota -- the only continuous population of wolves in the lower forty-eight states. They came back to Wisconsin on their own in the mid-1970s. The Endangered Species Act allowed their population to grow and thrive enough that they didn’t need that protection any more. They were delisted in January 2012, and we currently have 600+ wolves in the state. Now in another plot twist, a federal court has vacated the 2012 decision, which returns wolves in the Great Lakes Region to the Federal Endangered Species List. But all of those political controversies don’t really matter on a sunny day in the woods. Eventually the tracks collected in a narrow trail, loped off through the underbrush, and didn’t return. They left a mark on my thoughts, though, and when I ran into Sarah Boles, a carnivore tracker for the Wisconsin DNR, the wolf tracks were the first thing I mentioned. After a little follow up work with the help of Adrian Wydeven, retired DNR wolf ecologist, they determined that I probably saw tracks of the Seeley Hills Pack. Adrian went on to hypothesize that “Moves to the east side of the territory by the pack, including the Rock Lake area, may have been partly due to all the skiers and lots of people in the western parts of its territory last weekend.” That makes sense to me. That’s exactly why I was skiing at Rock Lake, too! With a love of wild places, a tolerance of cold, a taste for venison, and aversion of crowds, I, and the wolves who shared the trail, have quite a bit in common. Wolf 241F and her mate headed up the Ghost Lake Pack. Members of that pack later split and founded the Seeley Hills Pack that now roams east of Cable, WI. Adrian Wydeven, Wisconsin DNR. It is always a thrill to find evidence that you are not alone on the trail. I hardly dared to glance at the thermometer in my car as I headed to the North End Trailhead. The peak of afternoon temperatures had passed, and I knew it was only downhill from here. But the late-winter sun shone brightly, and the lure of the forest and ski trails pulled me along. Crossing a bridge across the Namekagon River, I took a moment to enjoy the rare beauty of flowing, swirling, glittering, liquid water. The watery, wintery scene must have fired some memory synapses in my brain, because into my mind’s eye flashed the image of another river flowing through snow-covered banks in Yellowstone National Park. A coyote paused on the opposite bank, and an expansive valley stretched into the distance, illuminated by gaps in a snow squall. In the foreground, my memory followed the flight of a bird as it whirred upstream, just skimming the Lamar River’s quicksilver surface. The small, dark gray darter with a wren’s jaunty tail landed on an ice-crusted rock just long enough for us to catch a glimpse. Then it dove under the current with a motion as fluid as the river itself. Seconds later it popped back up on the rock, with an insect larva in its beak. Gulp! The snack was followed by a series of high, clear, bubbling whistles and a few bobs—not just with its tail, but with its whole rear end. We were charmed. 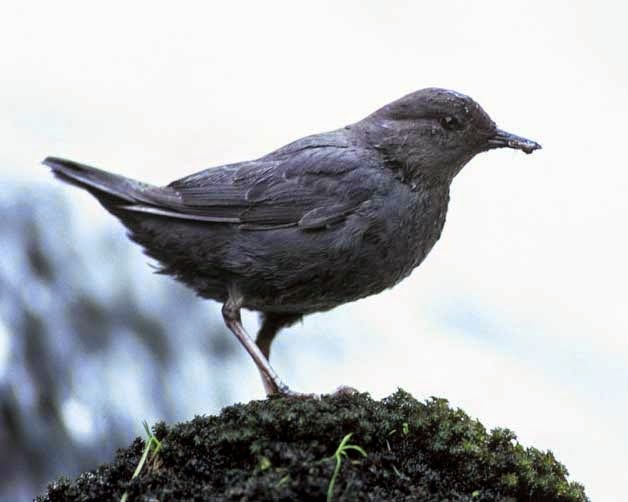 The American Dipper is North America's only truly aquatic songbird. It lives along clear streams and rivers out west, never venturing far from tumbling liquid. Even in winter, dippers continue to defend a feeding territory along the river. The food dippers seek is the same stuff that bobbing Junior Naturalists catch every summer during our Museum programs on the Namekagon River: aquatic larvae of mosquitoes, dragonflies, caddisflies, mayflies; snails, worms, small fish, fish eggs; and a few flying insects, too. Since aquatic invertebrates are found across the country, I’m not sure why dippers don’t live in the Midwest, too. Perhaps our rivers freeze over too frequently? Even out west, dippers may migrate a short distance to a river that stays open. I love polar plunges as much as the next person, but I can’t imagine swimming for a living in the winter. According to one report, dippers even survive Arctic temperatures down to negative forty degrees Fahrenheit by swimming in spring-fed streams. Of course, dippers have adaptations that help them achieve such feats, just like I have a bag full of cold-weather gear that will allow me to ski safely in sub-zero temps. Their feathers, like my wool sweater and windbreaker, are perhaps their most visible adaptations. Dippers have twice the number of contour feathers as a normal songbird. They also have thick down feathers interspersed between the rest, in places that would be bare skin on a different bird. The density of their insulation is only part of the solution, though. The dipper’s preen gland that secretes water-proofing oil is ten times larger than the same gland on any other songbird. According to David Attenborough, dippers are so well-waterproofed and buoyant that they have trouble staying submerged! Luckily, dippers’ short, powerful wings, and rudder-like tails give them the power to make short dives and overcome river currents that would knock a human down. Long legs and sharp claws allow them to wade for food as well. While most songbirds aren’t adapted to hold their breath, dippers use nasal flaps to plug their nose, and store extra oxygen in their blood. I might put on goggles to protect my eyes from the cold, but dippers use clear eyelids called nictitating membranes. They have built-in contact lenses, too, in the form of muscles that change the shape of their lens to adjust between vision in air and water. Air and frozen water were most of what I saw on my frigid ski, but I felt exhilaration from the sunshine and a crisp sort of cleanliness. I’m hardly ever sorry after an experience with nature’s extremes. Life on the edge keeps you sharp. Which, perhaps, is why the dipper so charmed us on that day in Yellowstone, with the snow squalls and coyotes, and furtive sunshine. Indeed, Muir has some excellent advice regarding the dipper: “Go see him and love him, and through him as though a window look into nature's warm heart." Dippers are the only aquatic songbirds. With thick, oily feathers and lots of down, they can dive into flowing rivers all winter long. I could see the five-year-olds wiggling in their circle-spots as they struggled to keep their guesses in their heads. Two cloth bags containing natural objects were making their way around the circle, and I smiled at the puzzled looks on their faces when they felt the hard, scaly surface of a beaver tail. The second bag contained a duck wing. It sparked more recognition and more secret-keeping challenges as they recognized the feel of feathers. Cable Natural History Museum naturalists visits eight local school districts in Northwest Wisconsin three times each year for our MuseumMobile program. The kindergarten lessons are some of my favorites. I recently brought the tub of goodies to my niece and nephew’s classrooms in Iowa, too. We talk about using our senses to explore nature, and listen to lots of the kids’ stories about the deer my dad shot, or the wolf my brother saw, or the beaver that slapped its tail at me. In kindergarten, stories are king. My favorite story comes when I open up a plastic sugar shaker they’ve been rattling around to test their sense of hearing. Into my hand roll three dried goldenrod galls. Usually the faces of at least one or two kids light up in recognition. Yes, they’ve seen that in the field behind their house, or on a walk in Grandma’s yard. It’s fun how even the most squirmy kids will sit still—mouths slightly open—as they become transfixed by a story. Robin Wall Kimmerer, author of Braiding Sweetgrass, speaks eloquently about the role of stories in science: “Our stories from the oldest days tell about the time when all beings shared a common language – thrushes, trees, mosses, and humans. But the language has been long forgotten. So we learn each other’s stories by looking, by watching each other’s way of living.” Science is one method we can use to “watch each other’s way of living” and discover the stories of other beings, now that we no longer share a common language. Science has certainly added detail to the story of goldenrod galls. And Bernd Heinrich is an excellent example of a scientific storyteller. In his book, Winter World, he explains that the gall fly larvae react to cold fall weather by producing glycerol (an alcohol) and sorbitol (a sugar) that act as antifreeze. The colder the weather, the more antifreeze the larvae produce. In addition, northern larvae, who expect to encounter more severe temperatures, cause themselves to freeze solid by releasing a protein into their blood that provides nucleation sites for ice crystals. The benefit of this is that the larvae avoid supercooling and instant, deadly, freezing. Instead, as the protein-enriched larvae cool slowly in milder temperatures, the intercellular liquid freezes first, concentrates sugars in little pockets, and pulls more water out of the cells. The cells become so dehydrated that few damaging ice crystals can form inside them. Science is amazing at telling stories like sugar-filled freezing bugs and survival against all odds. I feel it’s my job to re-tell those stories to as many humans in as many ways as possible. Maybe one of those intently listening kindergarteners will grow up to be a story-discovering scientist. After the lesson, as the kids lined up for lunch, I heard a small voice by my side. “Can I give you a hug?” asked the little girl with the glasses. It doesn’t take a scientist to discover that she, too, has some concentrated sweetness. The larvae of goldenrod gall flies force the plant to grow a house around them. There they spend the winter, unless a bird eats them or a kid dissects them. Photo by Emily Stone. Dusk was settling in as I coasted down one of the many hills on the Rock Lake Trails near Cable. With no recent snow, and strong, bitter winds, tree debris was strewn all over the ski trail, and had gathered in the tracks. Feeling like Super Mario jumping over obstacles, I lifted my skis—Right! Left! Left! Right!—over a cluster of oak leaves, a knobby stick, a white pine cone, and a single oak leaf. As my speed gathered on the hill, I could barely keep up. And then: scrrraaape…the sickening noise of an acorn cap vibrating on my skis’ fish scales was the sound effect for losing one of the lives on my fresh coat of glide wax. Acorn caps; pointy-tipped red oak leaves; and knobby oak twigs were by far the most common debris on the trail. The dry, sandy, well-drained soil on this glacial pitted outwash plain makes great habitat for oaks. As far as I can tell, this year was a mast year in the Cable area. As mast trees, oaks save up their energy for three to five years before producing thousands of acorns all at once. All the trees in an area will mast in the same year, and with thousands of acorns available at once, the hordes of acorn-eating seed predators cannot possibly eat them all. Some, at least, will survive to grow a new tree. Judging by all the tracks along the trail, there are plenty of critters already on-hand to eat the acorns. Four-footed red squirrel tracks crisscrossed the trail and connected every tree. I suspect that the bounty of acorns stored in their bellies and their food caches will give them a very successful breeding season starting in March. In the midst of the mess of squirrel tracks, there were the loping, five-toed tracks of a fisher taking advantage of the easy travel in the groomed trail. Along with hares and porcupines, red squirrels are one of the fisher’s favorite prey. As the acorns feed the squirrels, the squirrels will soon feed the fishers. The predator’s tracks are already common here. Will this mast year allow them to increase even more? The old snow pack held a perfect record of days of activity in the woods. Mouse tracks caught my eye next. Their tiny, four-footed patterns scurried among the shrubs, connected by a thin tail-drag. Mice are food for almost everything in the forest, including fishers. And deer ticks. As the cases of Lyme disease in Wisconsin have increased – 300% since 2000 – both mice and ticks are getting the blame. Mice are the preferred hosts for deer ticks (also known as black-legged ticks), and are very effective at transmitting the bacterium that causes Lyme disease. Mice can also raise several litters of up to 9 young per year. They mostly breed in spring and late summer, but increased food availability or mild weather can extend the season from March through October. These local mice may have already had an extra litter or two in response to the acorn mast. The repercussions of mast years on mice are wide-ranging. Scientists have noticed that an increase in mouse hosts for deer ticks results in an increase in Lyme disease cases two years after the mast. First the mice increase, then the ticks increase. Then the plentiful mice eat themselves out of house and home. Their population crashes without the mast, and the ticks go looking for a new host – you, or me. By this pattern, this summer should be fine, but prepare to tuck you pants into your socks during summer 2016! A few minutes after the fisher tracks veered off into the woods, I noticed that I was following the dainty tracks of a fox up a hill. Oak leaves in the tracks caught my skis at awkward moments, and I suspected that the fox was here in the oak grove because that’s where the mice are. Red foxes are often held up as the champions in our fight against Lyme. They are quite good at hunting mice, and will cache mouse-snacks for later consumption when numbers are high. As a result, they are much better at controlling mouse populations than their coyote cousins. But coyotes don’t tolerate foxes, and coyotes have greatly expanded their range in the absence of wolves. Our historical predator management policies may have doomed us to disease. I’m happy to note that my favorite haunts in the area all boast more fox and wolf tracks than coyote sign. Near the end of the loop trail, on the way back to the car, I came across a wide area of messy snow. Deer had been pawing through the shallow drifts to get at acorns in the leaf litter. Their pointy hooves marred the ski tracks, too. Deer also benefit from mast, and they have often been implicated in the spread of Lyme disease. But they are host to adult ticks, not the nymphs that are so efficient at making us sick. Studies show that deer numbers don’t correlate with tick abundance. They may wreck the ski trails more than a mouse, but the mouse is more of a threat to my health. Ralph Waldo Emerson was very poetic when he philosophized that “The creation of a thousand forests is in one acorn,” but he didn’t yet know wide-ranging effects that the thousands acorns in just one of those forests could bring. Oaks and their acorns are part of a cascade of effects that impact mice, foxes, ticks, humans, and more. Photo by Emily Stone. Mice leave an out-sized footprint on the forest as their populations rise and fall. Photo by Emily Stone.